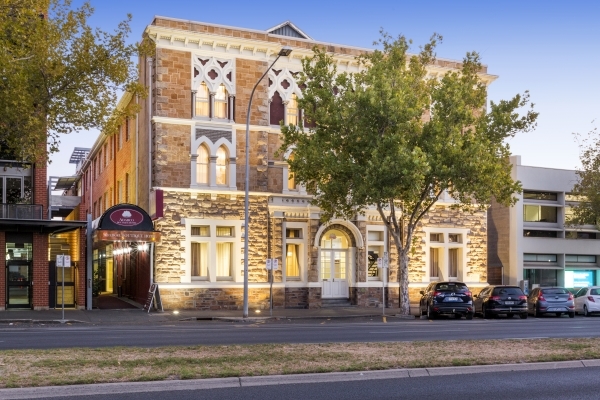 Adabco Boutique Hotel, in the Adelaide CBD’s east end, has been listed for sale and is expected to fetch over $15 million. CBRE’s Scott Callow has been appointed to market the boutique hotel at 219-223 Wakefield Street on behalf of Adabco Lodgings Pty Ltd. The 69-room hotel, which is managed by 1834 Hotels, occupies a 19th century heritage, gothic style building and has been refurbished with modern amenities and large accommodation suites. The opportunity also offers buyers with potential to increase the number of rooms and expand the hotel’s food and beverage operations. Mr Callow said the listing is expected to attract significant interest from both interstate and overseas parties that view Adelaide as an increasingly important market to have a presence in. “We anticipate there will be multiple buyers from the broader Australian market, as well as overseas groups looking to build on their Australian operations. Adelaide’s hotels market has experienced strong growth, largely driven by the cities growing sport and event calendar which is attracting domestic and international travelers, and I expect prospective purchasers will be keen to capitalise on these tourism fundamentals,” Mr Callow said. The hotel is within close proximity to the city’s key attractions including Rundle Mall, and is surrounded by an abundance of cafes, restaurants, pubs and transport routes. In addition to its onsite parking, guests also benefit from the hotel’s rooftop deck and being within 20-minutes of Adelaide Airport. Adabco Boutique Hotel is to be sold by way of Expressions of Interest close is now Thursday 7th June at 4pm (AEST).